Born and raised in Wisconsin, known for their cheese, beer and Packers, I would be remiss to not share this amazing Beer Dip recipe that my sister in law introduced me too. It’s a perfect pairing with pretzels or Frito scoops and is always a hit at any party. This makes a fantastic game day food, and I planned on sharing it again when my Pack headed back to the Superbowl, but I won’t dwell on that heartache. The irony here is that I don’t drink any beer – never have, never will, and I don’t like the taste one bit, but that doesn’t stand in the way of me making this Wisconsin beer dip, a game-day favorite. I’m always on the hunt for recipes that whip up quickly. Just a dash of beer mixed into this recipe adds an unbelievably unique flavor. It’s completely addicting, and makes a huge amount for any get-together. The longer this Beer Dip recipe sits, the better it gets, so make it the night before to allow the spices more time to blend, or at least three hours before serving. Refrigerate till ready to serve. Are you looking for another great party or game day appetizer? Check out my Buffalo Chicken Dip Recipe (be prepared to lick the the bowl clean) or Best Cheese Ball Recipes Ever. 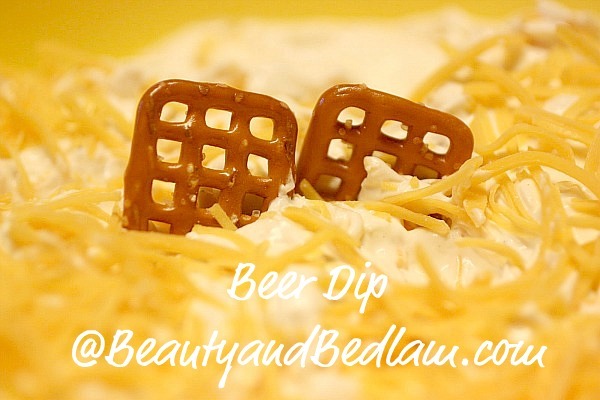 Summary: This creamy Beer Dip recipe is perfect with pretzels or scoops. This is one of those “lick the bowl clean” recipes. Mix cream cheese, sour cream, dressing, and beer til you reach your desired creamy consistency. Then mix in 1/2 cup of cheese, leaving the remaining cheese to sprinkle on top. Refrigerated overnight to let the flavors marinade or at least 3 hours before. Before serving, garnish with bacon bits and green onions. Serve with pretzels or scoops. Don’t miss the launch of 10 Minute Dinners. It’s now live! Quick and easy meal ideas for every day life. You cheese heads! Always coming up with another amazing way to cover a chip with cheese! I bet this would go great with my beer bread recipe! Then I would be able to use up the extra beer (as I don’t drink it either). Heartbreaking year for the Pack, but I have a good feeling about next year. GO PACK GO! I can hardly wait to try this. Thanks for sharing. I actually make this ALL the time – it is alway a requested dip I bring to parties : ) Everyone always LOVES it. looks great, can’t wait to make it! Ok call me dense but when you say 1 package of Ranch are you referring to the premade bottle of ranch dressing or the packet of dried ranch mix? Thank you! No, I am sorry. I should have clarified. The DRY Ranch mix. It acts as seasoning. I am off to add that to the recipe. Thanks for asking. Is it just mixed herbs? Or salt too? Which herbs, and how much? I am trying to think through what else you could use. The dry Ranch mix is a dry Ranch salad dressing mix where when you add oil, it’s a salad dressing. Do you have anything like that there, that is a substitute for RAnch salad dressing (but in a seasoning or mix form)? Otherwise, let me look around and see if I can find what is in it. @Jen, this is the recipe i use to make homemade ranch, it’s about as close to Hidden Valley as I’ve found. wow, that helps a lot! this is sooo going on my “cheat day”. why did I find you AFTER I started this ridiculous diet?! You say make overnight and refridgerate, but do you just take it out of the fridge and serve? Or does it need to be warmed? (because the hot wing dip is very similiar, but that one is served warm). Thanks! Dumb question… Since you don’t heat this up, is it ok for kids to eat?? No dumb questions here. It;s such a very small amount of beer throughout so much cream cheese, but if it’s a concern and/or there are younger children, feel free to use non-alcoholic. Jamie – honestly, I have never tried this as a warm dip, so I can’t even speak to its success. Typically, warm dips are baked at 350 til heated all the way through (20 – 30 min?) and shredded cheese is melted, but again, I have no idea how this would be. The cream cheese mixture is already smooth and not chunky when it’s served cold. This stuff is addicting! Can’t wait to make it for the Super Bowl! The spicy chicken dip recipe that I have (which is extremely similar to this) gets heated in the microwave for a few minutes, then 1-minute increments, until it is bubbly around the edges. I made this for super bowl tonight, tested it (GOOD), but will definitely try it heated instead of cold. Oh no, I am so sorry you didn’t like it. I am wondering if it’s with the beer that was used? Maybe I need to make sure and name a brand as that could possibly affect the taste some. Yes yes yes! I made this dip for Super Bowl this year, and it was SO good. I had plans to use the leftover to stuff panko breaded chicken… but there wasn’t any left. Being from Wisconsin originally myself, I’m definitely going to add this to my repertoire of dip recipes…. I bet it’s delicious!!! Oh My Goodness. I went to a school in Great Lakes, IL and there was a guy in my class who was from Wisconsin. His sister brought him some of this (he called it beer cheese) and shared it with me! At first I was reluctant but I will try anything once and I loved it!! As soon as I get home I am going to make this!! Thank you sooooooooooo very much!! Has anyone ever served this hot? I assumed it was heated when I first saw it. Seems like it might be good that way too but I don’t want to try it and ruin it. Please let me know if anyone has tried serving it warm…thanks! I think if you scroll down the comments, someone said they heated it and loved it that way. I “think” they told what they did. Do you put the other 1 1/2 c cheese on before you refrigerate it or after you take it out of the fridge, just before serving? oops and I also used a Deschutes Black Porter…..So yummy!!! I just want to make sure i’m understanding correctly… so you only put 1/2 cup of the shred. cheese in there and then the other 1 1/2 cups is sprinkled on top. it’s going to be a hit at tomorrows picnic, but want to make sure i’ve got it right! Is it fatal that I poured a whole 12 oz of beer in this? Quick question – how far in advance have you made this dip? I’d like to use it for a party I’m hosting on Wednesday evening, but would like to make it today so I can taste it first. Is that too long to leave it in the fridge? Thanks! I cannot wait to try this. I was looking at a few different beer cheese recipes but this seems like the best one. I messed something up as mine is super runny and I only put in 1/3 of a can of beer! Has a funky taste and salty tasting. I put it in fridge and hopefully it will thicken p overnight. Have a party tomorrow so hope it turns out! Hmm that is so odd. It shouldn’t be runny at all with all that cream cheese. Did you put in either two full blocks of cream cheese and carton of sour cream or three full cream cheeses? What kind of dish do you put this in? Does it stay thick enough to put on a platter or do you use some kind of casserole dish or pie pan? I am trying to make it look pretty and presentable but don’t want it falling off the platter. Can’t wait to taste it! Thanks!! Mine ended up just tasting like ranch dressing…I only put in a packet, and followed the recipe to a tee. hopefully more time in the fridge will help! I just want to swing by and say I’ve made this a few days in advance and it was just as good as when I make it a night before. Also, I want to thank you for posting this recipe because its a new favorite around here among family and friends! Monica – thanks so much for letting me know. Now my readers know that they can nibble for days before the guests even come. 🙂 Love that!! Should the beer be flat? Just made this for a Christmas party we are having tonight!! So excited to try it. I make this dip for almost every party because people love it so much; thanks so much for sharing this!! I made this dip Monday for Christmas yesterday, and I have a good amount left over. If left in the refrigerator, is it ok to serve the leftovers this Sunday? I’m having some friends over, but don’t know if it will go bad by then. Thank you! Yes, it should be fine. When we have family reunions, we keep some in the fridge the whole time. 🙂 Since it’s sour cream and cream cheese based, it stays just like the normal containers. This is a favorite-I found it took more beer but make it to taste and the Ranch Fiesta is the best dry mix. So, you put 1/2 cup of cheese in the dip and 1 1/2 cups on top? Seems like that should be reversed, no? oh, nevermind, I read the other comments. 🙂 I can’t wait to try this. thank you!